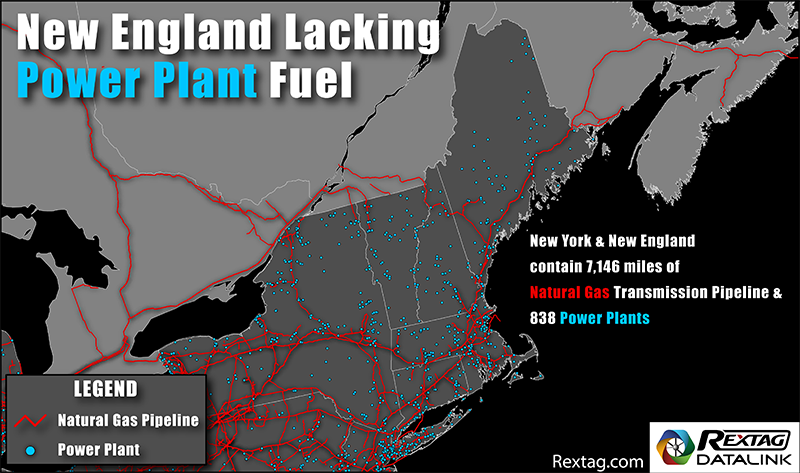 With Access Northeast Suspension, No Relief In Sight For Gas-Starved Region. Over 800 power plants still need fuel. Algonquin Gas Transmission, a unit of Enbridge Inc. (NYSE: ENB) withdrew its application with the Federal Energy Regulatory Commission (FERC) on June 29. The $3.2 billion project would have expanded or upgraded about 125 miles of the Algonquin Pipeline system, which moves natural gas to the Boston area from an interconnect with the Texas Eastern Pipeline in New Jersey. The expansion would have added about 1 billion cubic feet per day (Bcf/d) of capacity to the pipeline, which has capacity of about 3.1 Bcf/d. However, the project, originally proposed by Spectra Energy Partners LP in 2015 before its acquisition by Enbridge, developing financing issues. The Massachusetts Department of Public Utilities (DPU) approved a surcharge on customers to recoup associated costs of construction, but that decision was overruled by the Massachusetts Supreme Judicial Court. That has made it difficult for the project to secure customers. According to Rextag Energy Data, only in the 50-mile area around New York City, there are 100 operational power plants with a total capacity of 23,3 GW (Gigawatts) (or 23,300 MW (Megawatts)). Many of these power plants along with information on transmission lines and substations can be found on the Rextag complete and up-to-date U.S. Power Grid Map.